Closure of a part of arterial Diamond Harbour Road owing to collapse of a section of Majerhat bridge caused huge traffic snarls since morning on Thursday, leading to delays and frayed nerves of commuters. 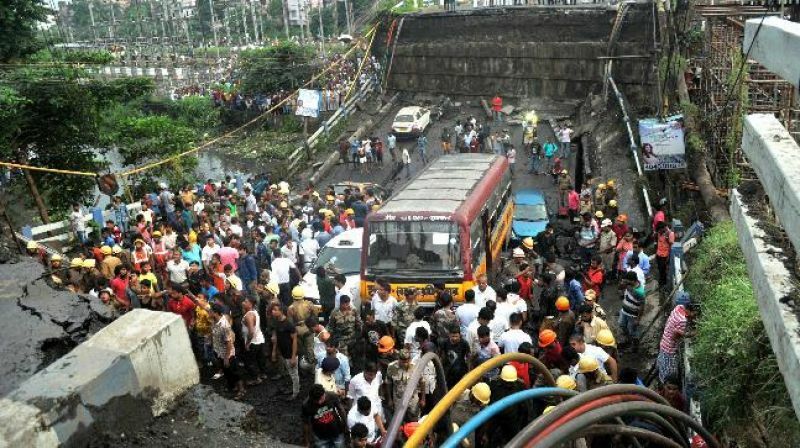 Police said apart from diversion of traffic owing to the collapse, a political programme at Esplanade in the heart of the city and another at Howrah bridge also affected traffic movement in the city during the day. Long queues of vehicles were seen in many roads in the southern and western parts of the city, as also in the Kolkata-bound stretch of Kona Expressway connecting national highways to Mumbai and Delhi. People going to work, schools and colleges were stuck in public and private vehicles, which took more than double the time taken usually to reach their destinations. Traffic were at a standstill or moving at a snail's pace on roads through which these were diverted owing to the closure of DH Road at Majerhat area. Sahapur Road, Hide Road, Alipore Road and many other avenues connecting the south-western parts of the city and vast areas of South 24 Parganas district took most of the diverted traffic load, police said. The Kona Expressway connecting national highways 6 (Mumbai Road) and 2 (Delhi Road) with the city through Vidyasagar Setu over the river Hooghly was also crammed with heavy goods vehicles which were entering the city's port and trading hubs through the night. With goods traffic entry to port and other places in the south having been restricted since Tuesday's bridge collapse, a huge number of heavy vehicles were entering the city last night leading to the jam, police said. A political programme at Esplanade that was attended by hundreds of people coming from districts and a protest programme on high petrol and diesel prices by the Congress on Howrah bridge also affected traffic movement in the city, police said. "It takes an hour for me to reach the IT hub at Salt Lake Sector V where I work from my residence at Behala, but now it is taking nearly double the time," said Subho Ganguly, a commuter. A student who used to reach his school at Kidderpore in just over 15 minutes from Behala, the worst affected area in south-west Kolkata owing to the bridge collapse, Thursday reached in nearly an hour, his father Kallol Nag said. "It is going to be a nightmare for people living in Behala with the Durga Puja approaching," said Ratri Banerjee, a school teacher who resides at Sakherbazar area of Behala. Traffic restrictions are imposed to ensure smooth movement of vehicles during the Durga Puja when a large number of people came on the road for pandal hopping.